Leaked scenes from the censored Al Jazeera undercover documentary, "The Lobby - USA," purportedly show an Israel lobbyist astroturfing an anti-BDS "student" protest at the 2016 Students for Justice in Palestine national conference. The Grayzone Project has released scenes from an investigative Al Jazeera undercover documentary, "The Lobby – USA," whose publication was blocked by the government of Qatar under Israel lobby pressure. According to one Hoover Institution campus fellow, "This is the first foot soldier activity that I think we've been forced to do." A Hoover fellow who identified himself as "Marshall," explained the background of the protest: "It was basically like Noah Pollak coming in and being like, 'Look, there are these jihadis who basically support suicide bombing, and they're on a campus and you have to stop them.'" "It's a chance to shout at Arabs," another fellow interjected. Marshall, who is African American, divulged his fear that some media outlet might publish "a photo of Deon [another Hoover Institute fellow] and me together, and we're just like clearly identifiable. They're like, "Oh, who are these traitors who sold out to the Jewish conspiracy for money?'" He then joked: "I'm like, 'We did! We cost $50,000 plus benefits." [...]Pollak's Emergency Committee for Israel is part of a coalition of right-wing and Israel lobbying organizations that have devoted increasing resources to undermining the Boycott, Divestment and Sanctions movement, or BDS. Al Jazeera's censored "The Lobby" documentary exposes intensive collaboration between these US-based cut-outs, the Israeli military-intelligence apparatus, and pro-Israel oligarchs like Sheldon Adelson and Adam Milstein. For that reason, Israel lobby forces enacted a pressure campaign that appears to have succeeded in suppressing Al Jazeera's release of "The Lobby." The campaign consisted of visits by high profile Israel lobbyists Alan Dershowitz and Morton Klein to Doha, as well as threats from Congress to force Al Jazeera to register under the Foreign Agents Registration Act if it aired the documentary. Qatar has since donated $250,000 to Klein's Zionist Organization of America and other hardline Israel lobby outfits. Electronic Intifada reported in June that Qatar decided to nix "The Lobby" over "national security concerns." According to reporters Asa Winstanley and Ali Abunimah, there were concerns in Qatari governing circles that release of the documentary could even prompt the US to pull its Al Udeid Airbase from the Gulf country at a time when it was under embargo from Saudi Arabia and UAE, both close allies of Israel and the US. Despite the ban, pieces of the documentary have begun to trickle out. This August 27, Electronic Intifada released footage identifying Adam Milstein as a moving force behind the malicious anti-Palestinian blacklisting operation known as Canary Mission. The report came on the heels of a Grayzone exclusive naming pro-Israel lawyer Howard David Sterling as the owner of Canary Mission's web domain. 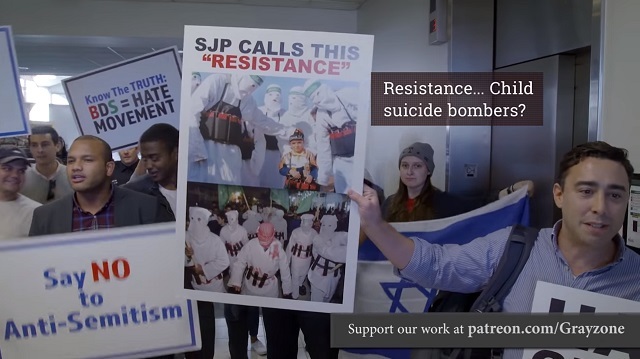 The footage revealed here by the Grayzone shows in vivid detail how the Israel lobby has compensated for its lack of grassroots influence by essentially paying for protesters. No doubt congress will investigate this foreign meddling ASAP!